On the western end of Panama City Beach, tucked off the road in a gated community is Pinnacle Port. The ultimate family destination at Carillon Beach is packed with every amenity needed. This recently remodeled 2 bedroom 2.5 bath unit is on the 3rd floor of the tower building with stunning views of the Gulf of Mexico. Bordered by Phillips Inlet and Camp Helen State Park on one side and exclusive Carillon Beach on the other there is plenty of wide open beach for all to enjoy. From the living room is a stunning view of the beach that can be seen whether sitting in the den or lounging on the balcony. Upstairs balcony looks down the beach over picturesque Carillon. Featuring king beds and a queen size pull out couch, this unit easily sleeps 6. A cozy day bed perfect for children is built into an alcove downstairs. Full Kitchen with brand new front loading LG washer and LG high capacity dryer in the unit. Free Wireless Internet available in the lounge area downstairs. Located approx. 10 miles east of Seaside, it is easy to take a safe bike road down scenic highway 30A. Only 30 miles from Sandestin and the Silver Sands Outlet Mall, shopping is easily within reach. Additionally, there are many new restaurants on the West End of the Beach at the new Pier Park shopping and Entertainment Center. Restaurants include Jimmy Buffet's Margaritaville, Red Brick Pizza Oven, The Back Porch, Long Horn Steakhouse, and Panera Bread Company. Shopping includes Dillard's, Target, and many more specialty shops. All along the beach there are fantastic restaurants featuring the best the gulf has to offer. We also have a restaurant guide to help with you vacation dining. Whether a local 'hole in the wall' like Dusty's Oyster bar (best fried shrimp and crab claws on the beach) or the internationally known Captain Anderson's they are all within a short drive. Just down the beach there is putt - putt, Gulf World with shows featuring marine animals and Zoo World! This is one of three units that we have at Pinnacle Port. We have owned a unit there since 1981 and believe it to be the best family location on the beach! The view from the living room is stunning. You can sit on the couch and feel like you are sitting on the beach. Great private beach without the commercial strip and crowd. Small but cozy. We loved our stay at Pinnacle Port. The unit had a everything we needed. The kitchen and sitting room were a bit small, but the bedrooms were big and had plenty of storage space to keep organized and clean. The kids loved the reading nook! The kitchen had everything we needed for cooking. Maintenance issues were immediately resolved. A/C condensing line was backed up on day 2 and as soon as we messaged Jackie, maintenance was there to take care of it. We would definitely stay here again. This is a lovely place. Right on the beach. Third floor and right near the elevator. The place was spotless and the beds were really comfortable. The kitchen was well supplied with pots and pans and knives, etc. The entire condo high rise was full of really friendly people and the staff were very helpful. The ecosystem of the beach and the dune lake was fascinating. We spent hours observing the wildlife. There is an exit from the dune lake to the gulf which changed everyday in dramatic ways. Not a static beach at all. The driving is easy. It's close to the airport and everything you need. Great churches. The area is full of state forests and parks and the resort life is fun too. Go to Gulf World. Best dolphin show ever. 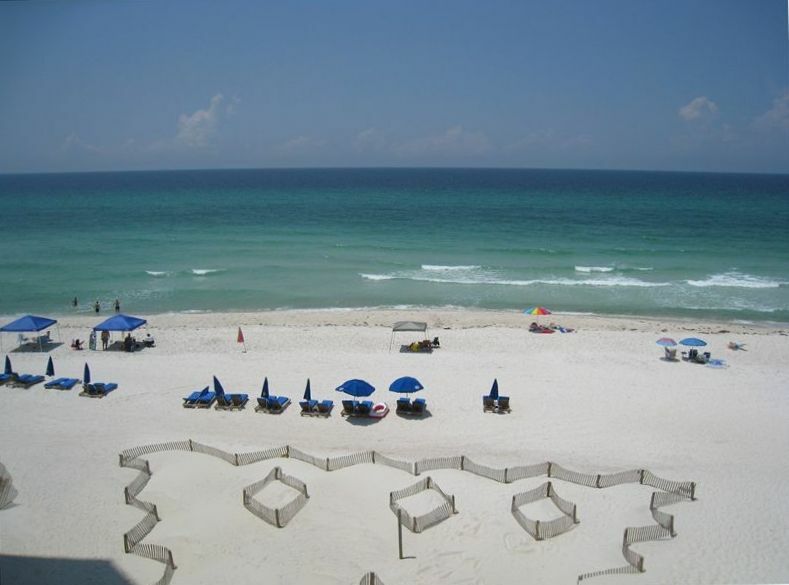 Panama City Beach is a great place to stay. You won't regret it. Great location, quiet beach, beautiful condo! We adore this place! Our first time here, and definitely not our last. The unit was clean, and beautifully decorated. The beds and furniture were extremely comfortable, and my children loved the little reading nook! Getting to the beach is a breeze, and the covered pool was just steps away. This made it so so so much easier with little ones. I loved the fact that there were grocery buggies and a pull through for unloading! How convenient!! The neighbors were so friendly there as well!! We will CERTAINLY be back, this is our new favorite place!! Thank you for sharing your piece of the beach with us! The condo was very nice and clean. Wonderful view of the ocean and convenient. Very nice lake to fish in. The only downside was the pool closing at 7:30 every night and the tennis courts were closed due to maintenance. I know this is not something the owner could control, but just a reference for someone looking to use these amenities. The condo has a beautiful view of the ocean. I can not say enough good things about this condo and the owners. First the condo is very clean, decorated so nicely, comfortable beds, awesome view from the balcony, I could go on and on. If you are planning to do some cooking which we did all the pots, pans, dishes, utensils are there. We took our 3 year old and 8 month old so being able to access the beach easily is a plus and you have that with this place! Very close to the 30a towns if you are wanting to check those out one day. The Publix and Winn Dixie is super close too. The owners were such a pleasure to deal with and very easy to get up with if you need to. One of the best places we have ever stayed and we have been going to the beach for a long time. I promise you will not be disappointed if you book here.